There comes a time in the creative process, or indeed in life itself, where fear and doubt creep in and threaten the very life of a big idea or major shift in direction. Can this really be done? What if it fails? What if nobody cares? What if I end up broke? Questions like this can keep truly groundbreaking ideas from ever seeing the light of day. In his new book, Uncertainty, Jonathan Fields deconstructs the journey of brilliant creative endeavors and provides context to the process that amazing work requires in order to be birthed. The force of fear can be crippling to most people, but Jonathan asks us to consider the small percentage of people who aren’t crippled, but instead thrive in this atmosphere that others find paralyzing. What is it about these people and their processes that allows them to ‘lean in’ while the majority of people run the other way? The answers that Jonathan offers forth come together to form a playbook for creative individuals that show us how we can face the fears and break through the barriers that keep most of us from achieving remarkable things in our lives. He gives actionable, concrete steps we can take along with a host of examples of others who have traveled this path before and achieved greatness. Uncertainty will appeal most to entrepreneurs and people in creative disciplines, or to people who aspire to set out on their own and pursue something meaningful to them. Jonathan discusses ‘certainty anchors’ that we can deploy as we go about our days to keep ourselves rooted while exploring the frontier of brave new thinking and ideas. The book itself serves and a certainty anchor for me, and I suspect it will do the same for others to dig in and discover its practical, timeless wisdom. Many of us find ourselves in positions of great uncertainty, and in tender positions that can be terrifying on the good days and outright paralyzing on the not-so-good days. 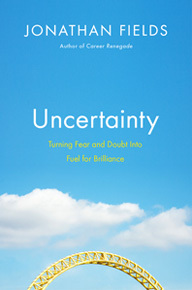 If this resonates with you, I’m highly encouraging you to order Uncertainty today. You’ll be glad you did. I speak from direct experience here when I say that Jonathan’s message has been a source of tremendous support throughout some pivotal transitions and creative processes in my life. Frankly, it has become customary for me to live on the edge of the cliff, and today is no different. But dancing with uncertainty is less scary to me now, and putting the practices Jonathan suggests in place coupled with the ongoing understanding and tremendous support of friends and family, I keep moving forward. How about you? Are you dancing with uncertainty in your life?